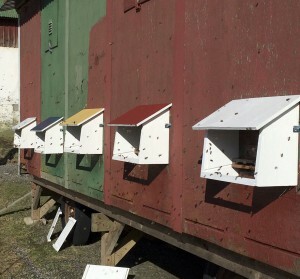 Already in 2002 Sven-Olof Ohlsson in Munsala Finland filmed bees grooming, shaking and biting mites. I have published two of his video clips on YouTube for him. You can see one here where the the mite had attached fast between thorax and the abdomen. The poor bee seemed to never stop shaking to get the other bees to help her. Ohlsson stopped filming after 20 minutes, but the bee didn’t. Here you see a successful bee removing and biting the mite. Another bee gave it a bite as well. It moved too much. Magnus was a beekeeper in his youth in western Sweden. He quit in 1996 but started again in 2013 with his wife Ulrika. Then they bought from an older beekeepers a pavilion with seven bee colonies, most of which were splits, new colonies. It was a big pavilion on wheels that they bought. It was not crowded with bees where this beekeeper lived from whom they bought the bees. Maybe a couple of miles (3 km) to other bees than his. He treated with oxalic acid against Varroa once a year. Nothing more was used for keeping the Varroa population down. And he bought a Buckfast queen now and then to help the genetic variation. 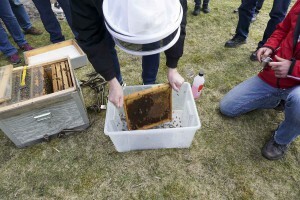 The hives in the pavilion are long hives with 30 combs 12″x12″ (30 x 30 cm). The pavilion was moved to Magnus and Ulrika in September. They saw wingless bees from three colonies. Two of these were splits from the third. Of the other four were at least two splits from one of the rest, No. 9. The fourth, No. 10, appeared to be related to No. 9, because of the behavior and appearance. Maybe No. 9 was a split from No. 10 in 2012. The argument for this is that in 2014 the queen just fell of the combs in No 10 and died. Perhaps the queen was the oldest of the two. Magnus and Ulrika has their bees quite isolated too (about 3 km) in relation to other bees. In October 2013 they treated all seven colonies with oxalic acid. From the three with wingless bees fell very many mites due to the treatment. From the other four just about 10 mites from each. These four were also the only one to survive the winter. In August 2014 they treated all colonies with thymol. Now they were ten. Magnus and Ulrika wanted to bring all colonies into a low level situation concerning mites as a start for the coming years. 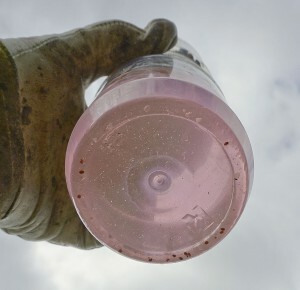 The next year they planned to check the infestation level of mites with the bee shaker bootle and treat only those with an infestation level of at least 3% in August. They probably did too many splits, as some were a bit weak in autumn. No. 10 was still there, but with a new Buckfast queen from a queen breeder. No split had a daughter of No. 9 or No. 10 as its queen. Only No. 9 had its original queen. No colony had been purchased and brought into their area from “outside”. All new colonies were splits from the first four who survived the first winter with Magnus and Ulrika. The mites that fell after thymol treatment were about as many as the previous year after the oxalic acid treatment, that is very few. Seven survived the winter. Three splits were obviously too small and did not make it. In autumn 2015, they wintered 13 colonies. 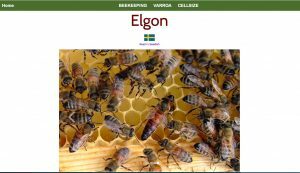 They controlled the infestation rate in August with the help of the bee shaker (http://www.elgon.es/diary/?p=794), ie alcohol sample of 300 bees. Only the “old” colonies were tested. Magnus and Ulrika did not want to weaken the splits made in 2015. Two of these were a bit weak in the autumn due to queen problems. If an “old” colony had more than 3% infestation rate (9 mites from 300 bees) also the splits made from it would be treated was the strategy. Those which had higher infestation rate than 3% in August were treated with thymol. There were three colonies that had just over 3%. Only those three which no splits had been taken from. Some of the other “old” colonies had only one mite from 300 bees, i.e. 0.3% infestation level. All the others except the three were not treated. Ten colonies survived to 2016. Two of the three dead were the weak due queen problems in the autumn. The third died of local starvation. There were some empty frames between food combs and the bee cluster. 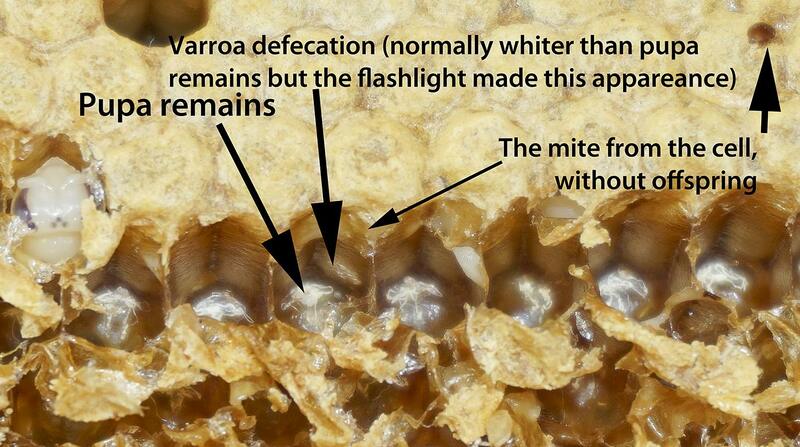 No colony during the last two winters have died because of large levels of Varroa. 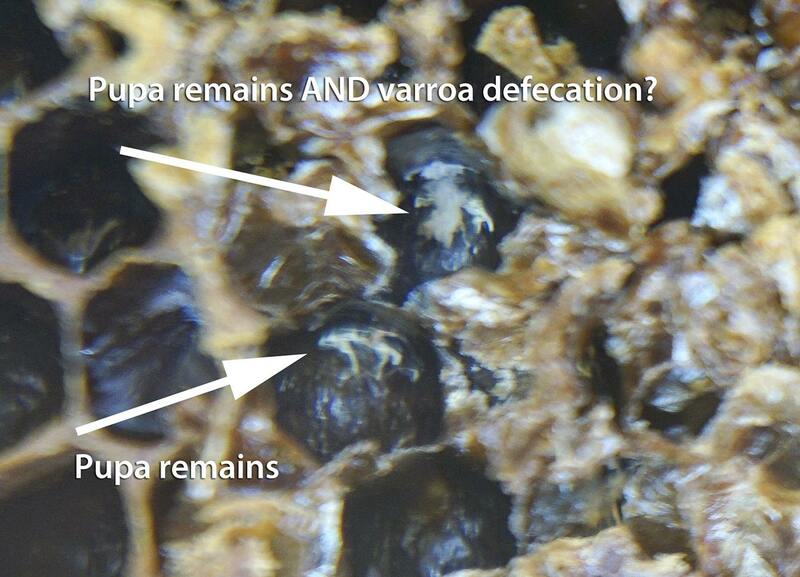 Varroa is evidently not a problem. 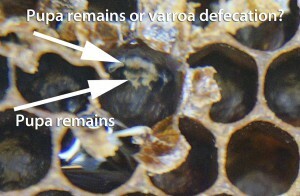 Varroa levels have always been low in these colonies that originated from bees from the No. 9 and No. 10, also in 2013. 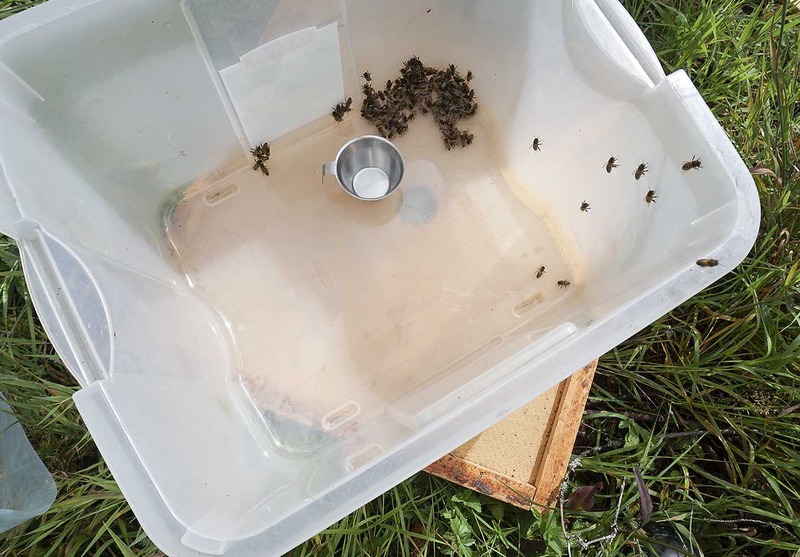 What naturally would come to mind is that we have found a tiny varroa resistant local bee stock genetically, if the queens are all descended from the No. 9 and No. 10. But that is not the case! 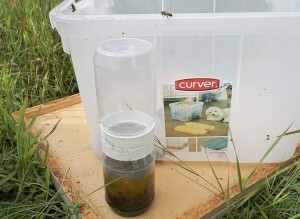 Several of the daughter colonies had received queen pupae from a queen breeder. Some had been laying queens from the same breeder. He doesn’t select for varroa resistance and use effective miticides. Still, even colonies with these queens have very small levels of varroa. But the worker bees that these queens were introduced into came directly or “indirectly” from No. 9 or No. 10. Some splits from No. 9 were made in 2015. The other “mother colonies” were splits made in 2014 from No. 9, though with queens from a Buckfast queen breeder. These colonies are not ffsprings genetically, “only” “social offsprings” through the worker bees. The colony No. 10, is the social offspring of the original No. 10. Eight colonies are social offsprings of No. 9. No. 9 have the original queen. Only No. 9 have a “true” varroa resistant genetic set up. 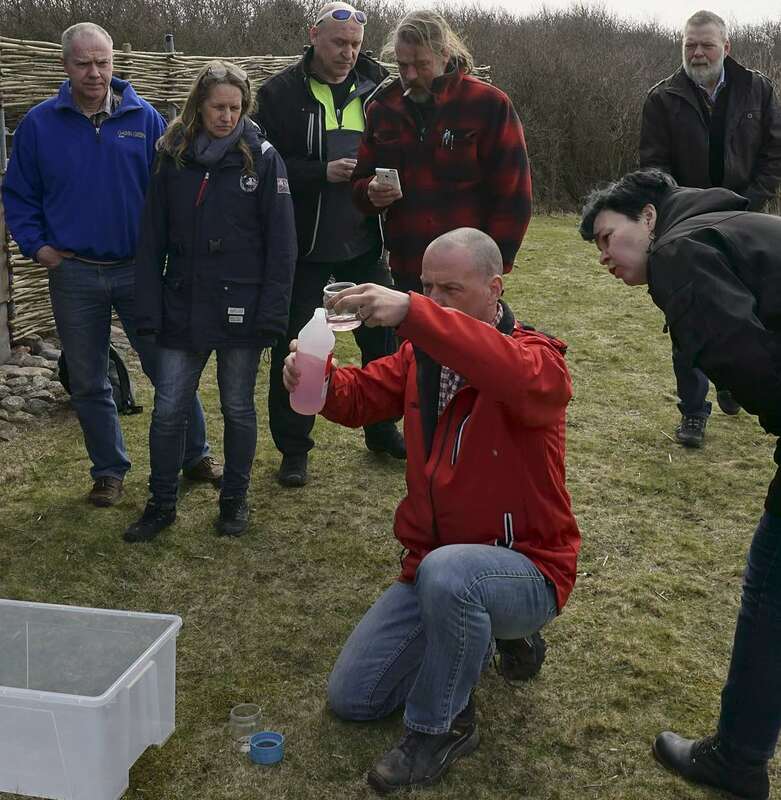 The first weekend in April 2016, I had a lecture at the Visitor Centre at Getteron at the west coast of Sweden close to the little town Varberg. I talked about breeding bees resistant to varroa. In the afternoon there were some workshops. 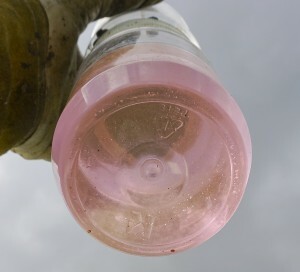 One on how to check the infestation level of Varroa with the Bee shaker. The other how to make dish cloth pieces with thymol to treat against Varroa. Magnus and Ulrika pouring alcohol in the Bee shaker. Somewhat more. Magnus had brought a colony that hadn’t been treated against varroa the previous year. The queen was an introduced egg-laying Buckfast queen from a queen breeder. 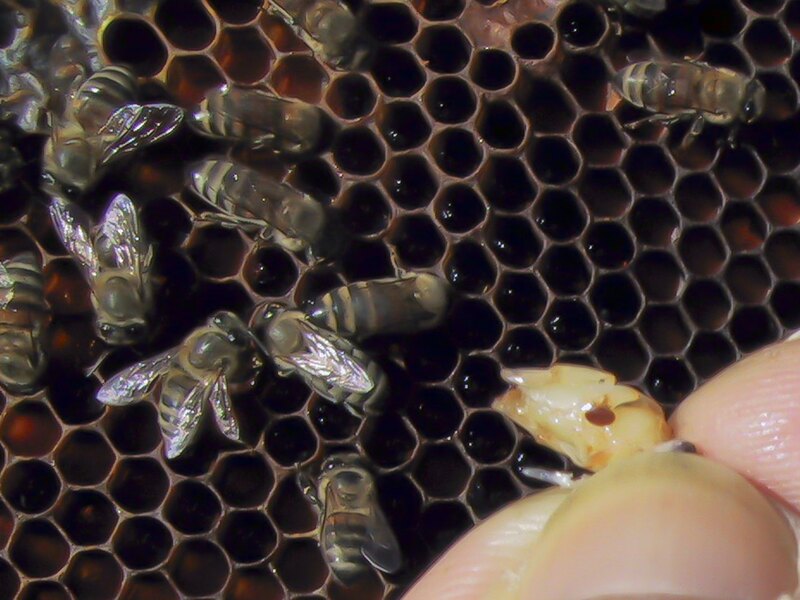 A queen which was not selected for varroa resistance. We hoped it would be a substantial amount of varroa in the colony so there would be some to count at the bottom of the Bee shaker. 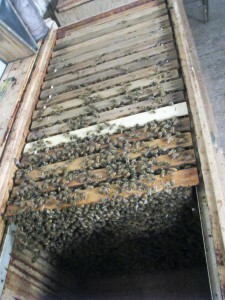 The fourth comb from the rear with a lot of bees on it but no brood, to minimize the risk of including the queen. The bees were shaken into a corner. With a measuring cup a little more than 1 dl bees were talken and poured into one half of the Bee shaker. After the bees had been poured into one half of the Bee shaker the lids were screwed on top. Then the alcohol was poured on the bees from the other half. This half was then screwed to the rest. Now the Bee shaker was shaken for one minute. Turned around, still shaken until all the alcohol had went down in the lower part. In August 2015 it was one mite in 300 bees in that test colony at the workshop. 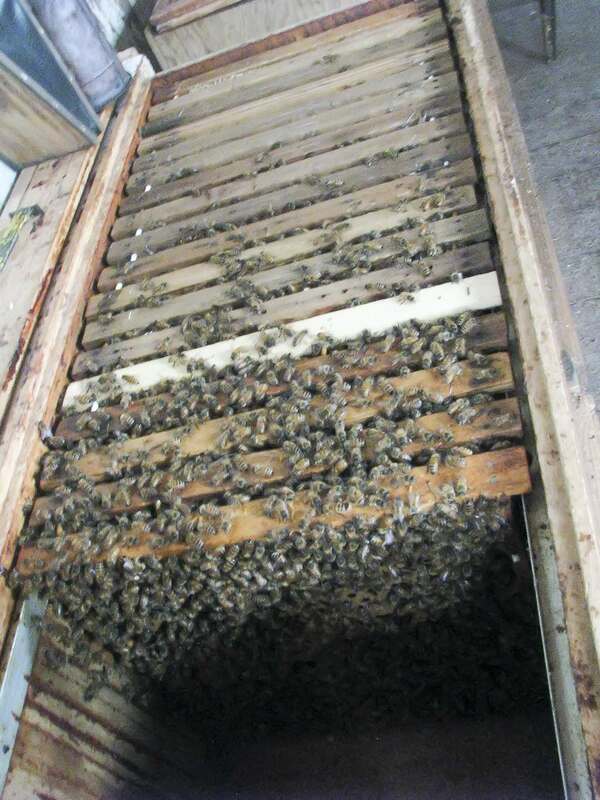 Now April 2 the colony was a strong and healthy colony of bees filling the box that had been the winter room. 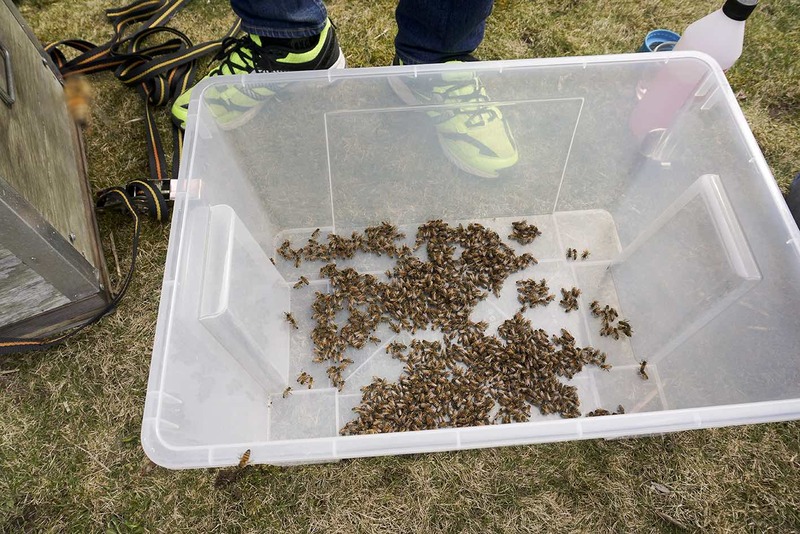 The bees were very calm and sampling went well. 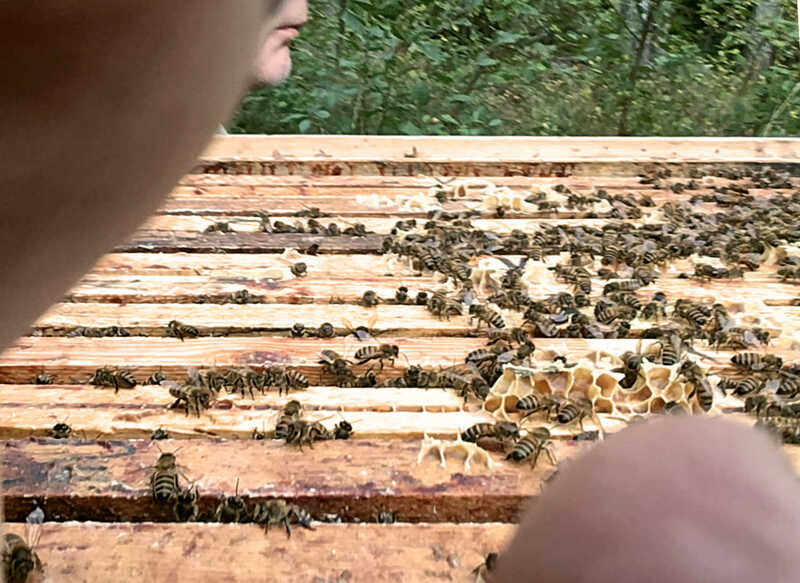 I lifted the fourth comb from the rear, with no brood, but close to the brood. To our “disappointment” it showed only one mite in 300 bees. One can truly say that we were surprised. 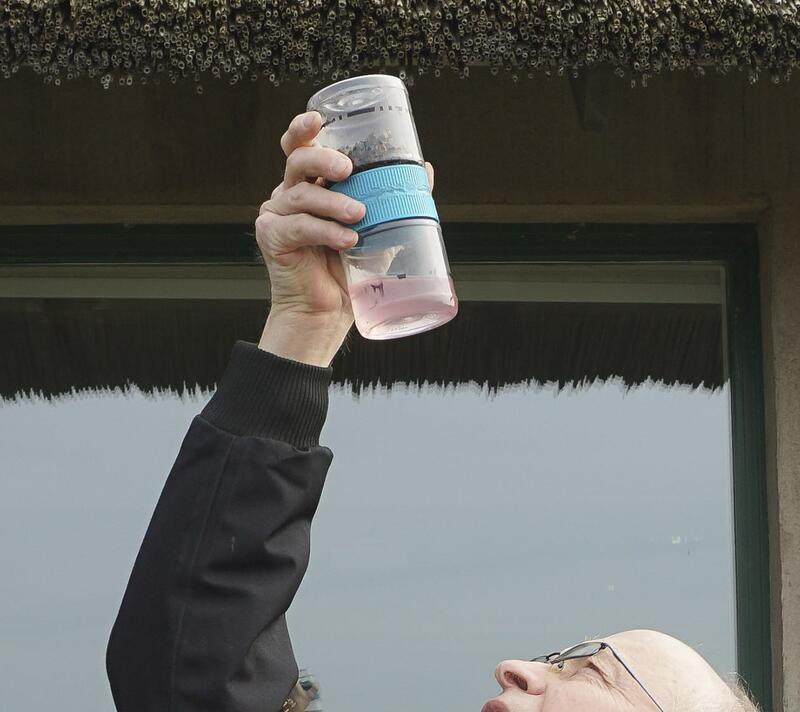 When all the alcohol had went down, the Bee shaker was lifted above the head and the mites were counted on the bottom of the Bee shaker. 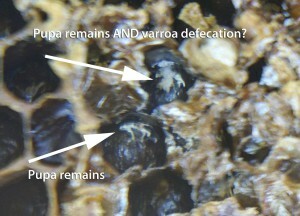 How could this colony be varroa resistant? And No. 9? And the colonies that were made with bees from No. 9 but with no daughter queen from No. 9. All Magnus’ and Ulrika’s current colonies and their social offsprings have demonstrated surprisingly low amounts of mites all of the years with them. 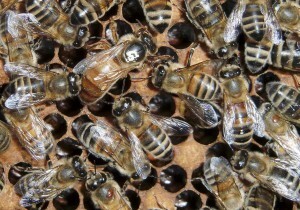 Although their queens are not genetically related to the original resistant colonies. They are though social offspring, as described above what that means. 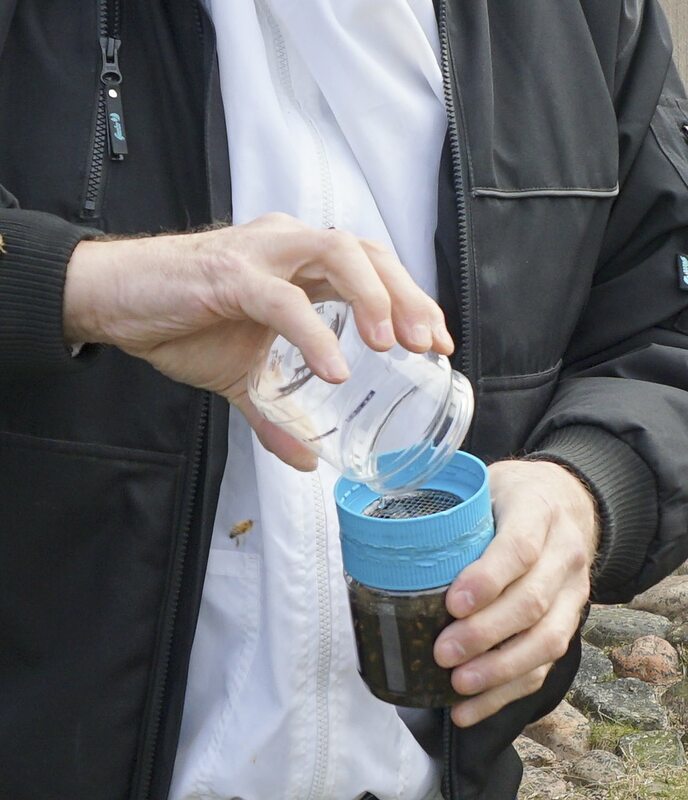 I had in my lecture talked about the experience of Hans-Otto Johnsen and Terje Reinertsen in Norway that can hardly be explained otherwise than that worker bees in resistant colonies teach other bees how to control mites. Sampling with the Bee shaker on Getteron confirmed what I had lectured in a most interesting way. Now is the time for beekeepers that have had varroa in their colonies for a few years and have not yet checked the downfall of mites after treating. Check the differences of downfalls between different colonies. 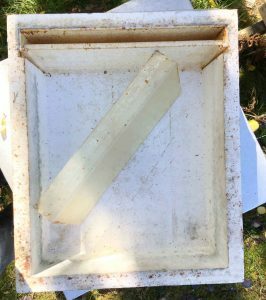 Especially you can discover good colonies in apiaries located somewhat isolated and in which there are not so many bee colonies. This lessen the risk for reinvasion of mites in the colonies. 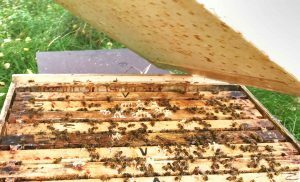 It’s good if the apiary have somewhat developed a stock of its own, ie no colonies or packages have been brought into the apiary in recent years and mostly queens have been bred from colonies in the apiary. I’m sure there are many resistant colonies to be found today, but you must look for them. You should make splits from the best ones. The poorest colonies should not be used to make splits from, in any case you should avoid it. 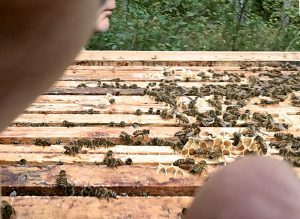 Of course, it requires a certain amount of resistant genes for a colony of bees to be able to develop resistance and be able to teach other worker bees how to control mites. When there are colonies which have developed good resistance it seems less genetic resistance quality is required to be able to be taught ability to control mites than to initially develop and learn this property. If you find resistant colonies, even if they are somewhat bad tempered, swarmy, and only give small crops of honey, take care of them like golden nuggets. Move them if you can to an apiary of their own somewhat isolated, a couple of miles (3 km) to the other bees. 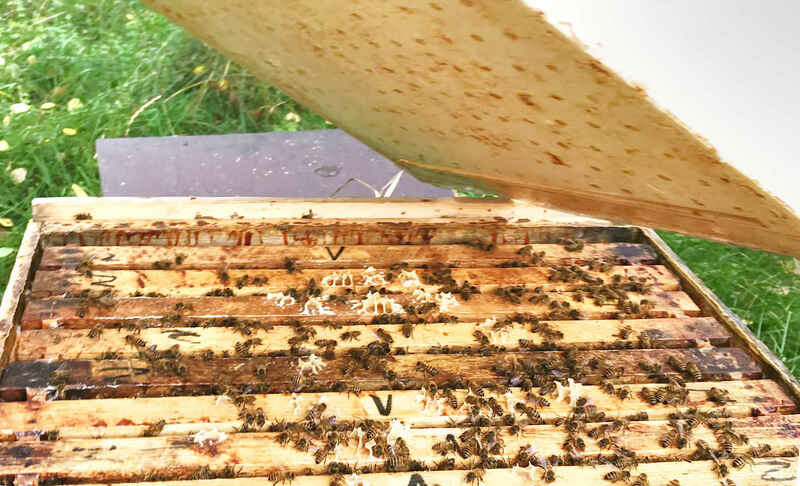 Make splits from them and give those splits pupae bred from good tempered bees, reluctant to swarm and high producing.. Then continue to do splits following year from the best varroa resistant colonies and let them make their own queens. 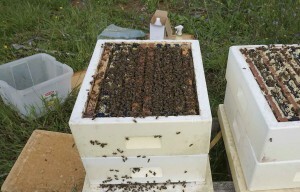 Doing so also from the original resistant colonies and let them make their own queens. Now there are good drones in respect to other good qualities from the previous year’s new colonies. Continue the following years to replace the poorest queens with those bred from the best in the apiary.